Following a debut tour in early 2017, ‘Armada Invites’ is set to return to China coming this month. 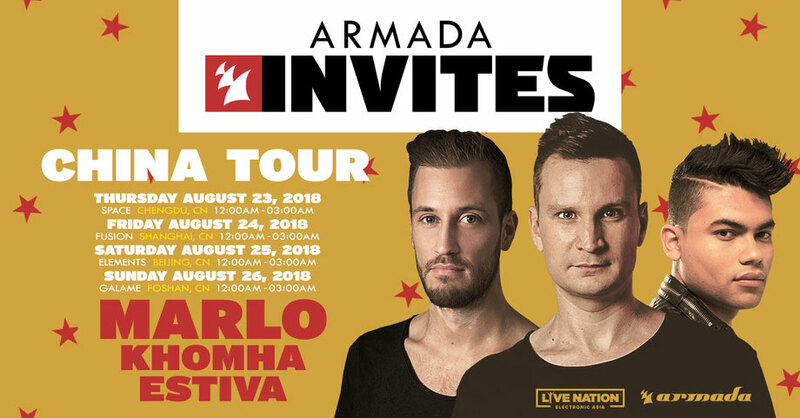 With MaRLo, KhoMha and Estiva on the line-up, it should be another good edition of the ‘Armada Invites’ series. Taking place from Thursday, 23 August to Sunday, 26 August, the tour, the first joint project with Live Nation China, starts off with a show at Space in Chengdu on Wednesday, after which the madness continues at Fusion in Shanghai, Elements in Beijing and Galame in Foshan on Thursday, Friday and Saturday respectively. 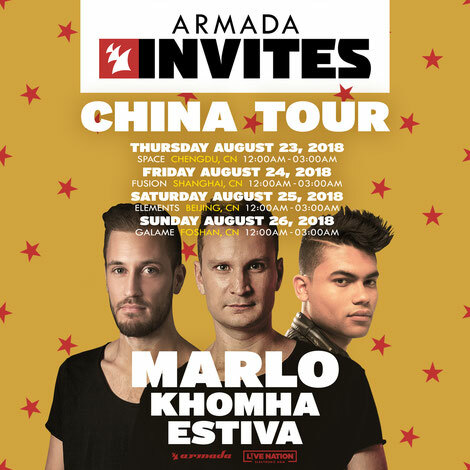 A frequent guest on the line-up of Armada Music’s global events, during this four-day China tour, the Australian trance artist MaRLo, who recently launched his own Reaching Altitude label under the wing of Armada Music, joins Colombian KhoMha as well as Estiva, who recently released his ‘Spectacle’ album. Armada Invites is Armada Music’s main global event brand, bringing a host of different artists and styles to all corners of the world. Its in-house namesake is a recurring event in Armada Music’s in-office club in Amsterdam with exclusive showcases from possibly some of the biggest and most talented artists in the world (such as Armin van Buuren, Borgore, Cedric Gervais, Eelke Kleijn, Erick Morillo, Gareth Emery, Kevin Saunderson, Lost Frequencies and NERVO) and reaches a worldwide audience via its livestream on Facebook and YouTube as well.